This testimony was given by Silas Soule, captain of the 1st Colorado Cavalry, Company D, who was called before the military commission investigating the massacre of Cheyenne Indians at Sand Creek, Colorado, in 1864. Soule gives a detailed description of the attitude and movements of the Cheyenne Indians and the Colorado cavalry forces prior to the conflict, as well as a summary of the actual events that occurred on Sand Creek. Although this commission was not a military trial, the format of taking witness testimony was similar. Colonel John Chivington, commander of the 1st Colorado, was allowed to cross-examine the witnesses called by the commission. 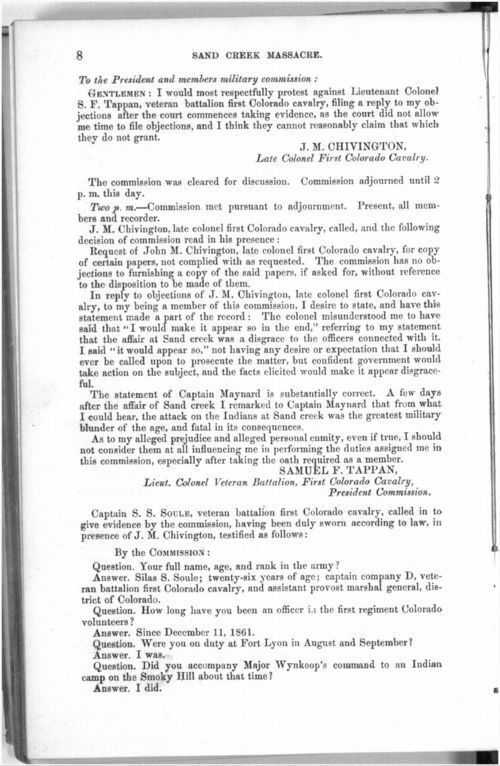 The testimony is part of a larger report containing evidence obtained at this hearing, titled Report of the Secretary of War, Communicating, In compliance with a resolution of the Senate of February 4, 1867, a copy of the evidence taken at Denver and Fort Lyon, Colorado Territory, by a military commission, ordered to inquire into the Sand Creek massacre, November, 1864. This testimony, while lengthy, provides a first-hand account of the massacre. Students could discuss biases and Soule's role in the conflict. It could be grouped with any of the other sources on Sand Creek that have been selected for this standard.